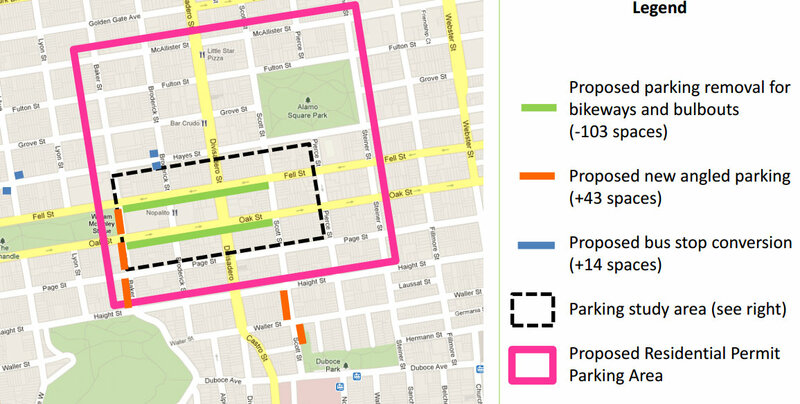 The SFMTA revealed the design [PDF] for protected bike lanes on three blocks of Fell and Oak Streets at an open house on Saturday. The plan would create a safer connection from the Panhandle to the Wiggle by installing a one-way buffered bike lane on each street, partially separated from motor traffic by planters. 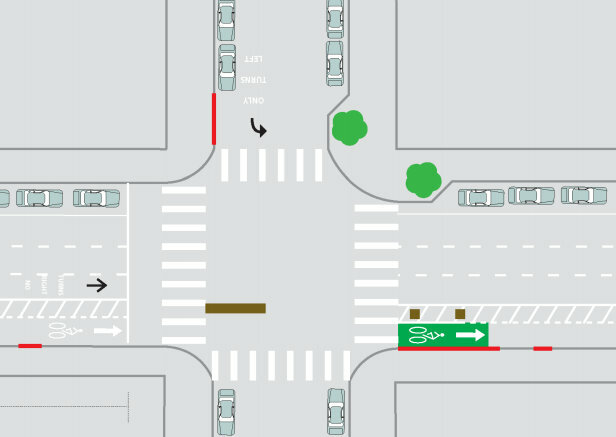 The proposal would also paint green markings where bike traffic merges with turning motor traffic, re-calibrate the traffic signals for 20 MPH movement, construct pedestrian bulb-outs and zebra-striped crosswalks, and add angled car parking spaces (mostly on Baker Street) to replace over half of those removed to make way for the bikeways. “We believe the designs shared at the community workshop should move forward and be implemented to make it safer for the thousands of people who bike this corridor every day,” she said. Although in January the SFMTA set the implementation timeline for next winter, staff said it has again been pushed back until spring, almost a year later than the city originally predicted. The SFMTA asserts that the project is on schedule according to the new timeline. 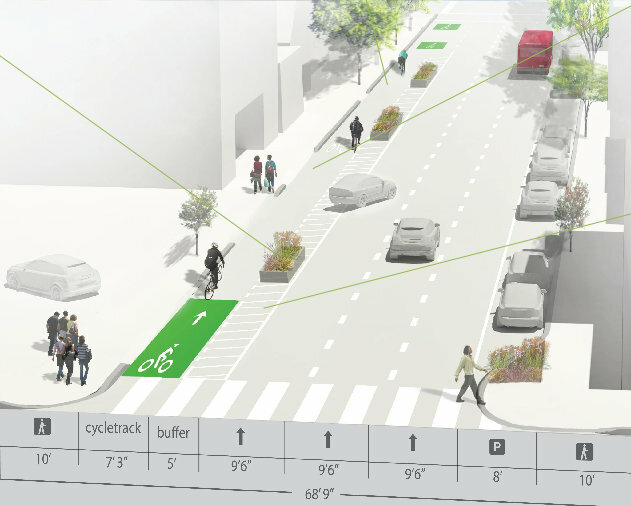 The plan uses green pavement treatments to emphasize a number of bike markings, including bike boxes, “super” sharrows where bikes and cars mix, and bike lane “entrances” at the beginning of each block. The approach at the intersection of Fell and Divisadero Streets, where green markings have already been added to reduce conflicts with drivers queuing up for the Arco gas station, would remain mostly as it is, though a bike box would be added. The hot spot in front of the Fell and Divisadero Arco gas station would look mostly like it does today. At Oak and Broderick Streets, drivers would be prohibited from turning right across the bike lane onto southbound Broderick using a physical barrier. That would also prevent through-traffic on Broderick from crossing Oak in the southbound direction. Oak and Broderick Streets, where a physical barrier would prevent cars from crossing the bike lane in the southbound direction. Turnout at Saturday’s open house wasn’t as robust as at December’s meeting, but comments from attendees seemed overwhelmingly supportive of the project. Still, a few critics seemed to keep staff and other supporters busy fielding complaints about the perceived trade-off of losing car parking — the main reason the agency ditched the original idea of implementing the bikeways as a trial this June. Fourteen more parking spaces would be created on Hayes Street by removing bus stops at Broderick Street and Central Avenue, which could also speed up travel times on the 21-Hayes line. SFMTA staff also provided a form for residents to petition for the creation of a residential parking permit (RPP) zone on their block, which would give residential car owners priority for curbside parking by imposing restrictions on non-permit holders. A block can only be added to an RPP zone with signatures from 51 percent of the residents. Roughly 120 paid parking spots were also opened for overnight parking at the Department of Motor Vehicles last year. To implement the project, staff said the SF Planning Department must complete environmental review, which would then need approval from the Planning Commission. He also said an SFMTA public hearing on the project will likely be held in May, although no decision would be made then. The project would then need to be finally approved by the SFMTA Board of Directors. Stay tuned for more details on the implementation process. An overview of the project. 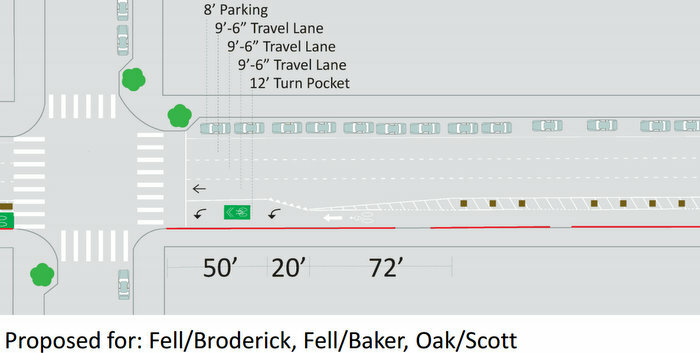 See more in the ##http://www.sfmta.com/cms/bproj/documents/OakandFellPublicMeeting3-31-12.pdf##PDF document##. A map of where car parking would be added and removed. "Mixing zones" would merge the bike lane with vehicular turn lanes at some intersections. As illustrated here, the project area is currently a hole of unrestricted parking surrounded by several RPP zones. A handy set of topography graphs illustrating why neighboring streets like Page and Hayes don't serve bicycle traffic very well compared to Fell and Oak. 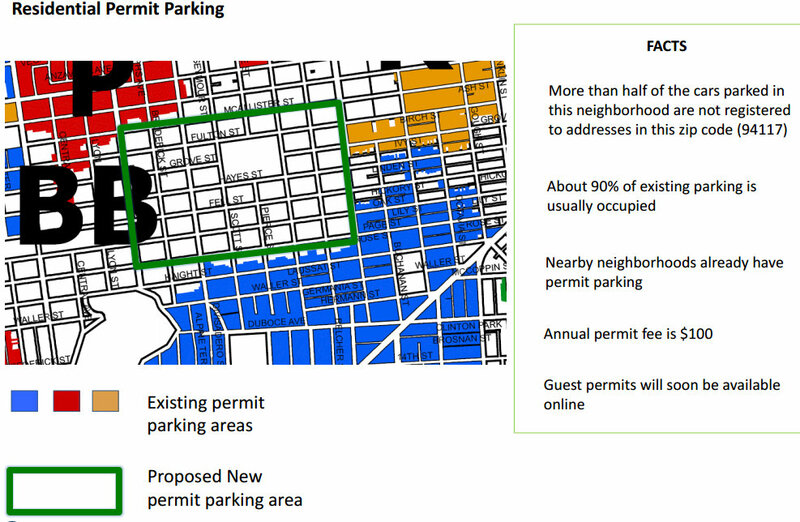 See more info in the ##http://sf.streetsblog.org/wp-content/uploads/sites/3/2012/04/OakandFellPublicMeeting3-31-12.pdf##PDF document##. Someone who is over it. ie: the incline is at baker, and only because the park goes downhill between ashbury and baker. Do any of you ever travel outside the US? You don’t know how easy you have it here crossing the streets. If people would just pay a little more attention crossing streets there would be far few accidents. Drivers need to stop texting and but so do pedistrians while crossing the steet. But we shouldn’t be designing our streets in such a way that, if a pedestrian (or cyclist) screws up (say accidentally walking/riding off their designated path either because of their own fault or somebody else’s), the price they pay for that mistake is death. I believe most people would prefer to live in a place that is not so cold and unforgiving (although, amazingly most Americans have just grown accustomed to our cities being so car-centric that they have convinced themselves that this is the price we must pay for the convenience of a car). And the way to fix our city from being so unforgiving is to realize that the problem is the cars (since they weigh thousands of pounds, have hundreds of horsepower literally at the tips of their drivers’ hands and feet, and whose drivers’ senses are dangerously dulled), and once you realize/accept this, the goal of urban design automatically becomes to minimize usage of cars (and if they are required, make sure they are traveling slow and understand that they are not the priority and hence pay attention to where pedestrians and cyclists are). Even though I agree that it is often the pedestrians “fault” many times they get hit by a car (and I use “fault” in quotes because the whole situation is not fair to begin with since are roads are optimized for cars, not pedestrians, so I find it weird to expect them to follow rules that weren’t designed for their safety but for optimizing car traffic), that doesn’t mean I think they should have to be seriously injured or killed for that mistake. To think this shows just how utterly car-centric we as a society have become, that unnecessarily think that we must accept all this carnage so we can have the convenience (and the environmental and health destruction) of the car. Hi, does any one of you know, what happened today morning around 8.30 a.m. at Baker and Fell, where cyclist and car collided? I walk my dog to Panhandle every day at this hour and experience how pedestrians, bikers and cars share their parth in this particular corner. This place just waited for accident to happen. Um, duh, there was work with the residents in NOPA and other neighborhood associations, and businesses along the street.